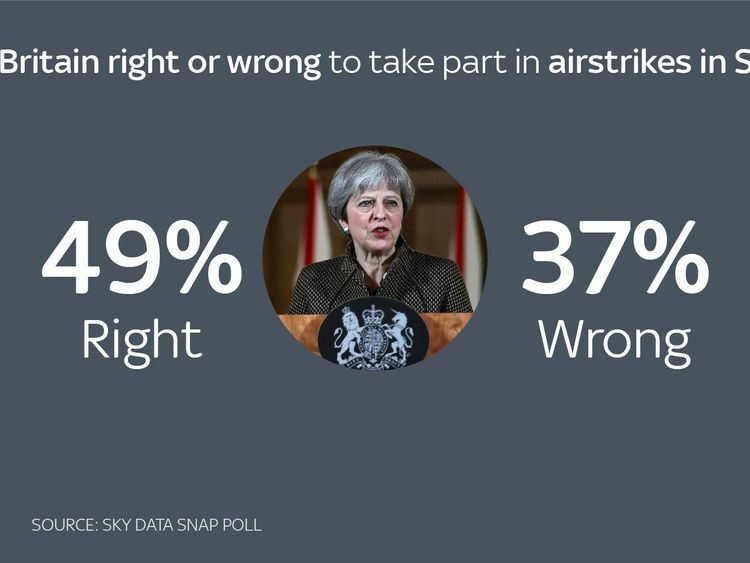 Last week, before the airstrikes, public opinion was evenly split on British military action in response to the alleged chemical attack in Syria - 36% supported such as move, 37% opposed it. 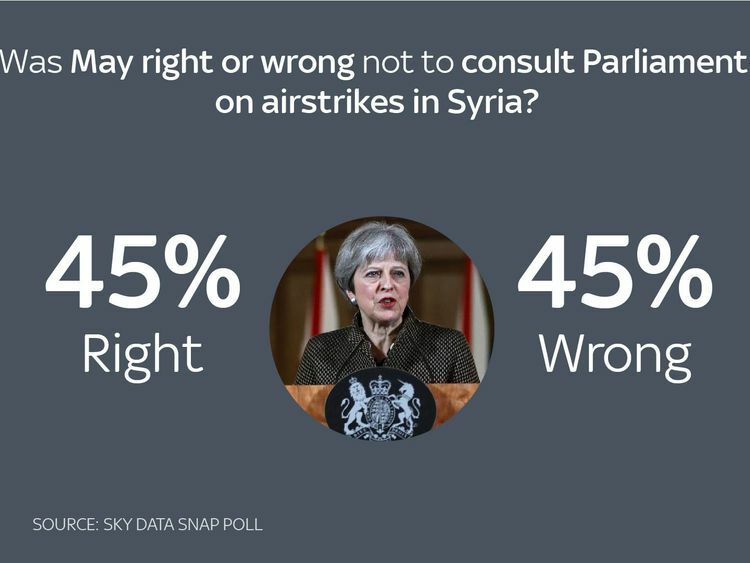 Opposition rose to 48%, with support down to 28%, if action in Syria meant conflict with Russia, which supports Syrian President Bashar al Assad.But the public are evenly split on whether Mrs May should have consulted Parliament before committing Britain to the strikes - 45% think she was right in choosing not to do so, 45% think she was wrong, while 5% answered neither and 5% answered 'don't know'. Older people are more likely to support military action - and the government's decision to go ahead without consulting Parliament. Those aged 55 and over support the airstrikes 60% to 29%, and think Theresa May was right not to consult parliament by 55% to 35%.Women are less likely to back Mrs May than men, however - women are evenly split on the strikes, with 40% in favour and 41% opposed, with 58% of men thinking they were right, 32% wrong.And women oppose the Prime Minister's decision to bypass parliament 50% to 40%, while men support the decision 52% to 41%. Sky Data interviewed a nationally representative sample of 1,031 Sky customers via SMS on 16 April 2018. Data are weighted to the profile of the population.For full Sky Data tables, please click here.